An ultralight merino-blend hoody that’s perfect for providing full coverage and maximum breathability on warm days, the updated Sphere Long Sleeve Hood remains a go-to for the mountains, the trails or long travel stints. The Sphere features Icebreaker's soft, comfortable and moisture-wicking Cool-Lite™ fabric, a blend of natural Tencel® with their jersey corespun fibers, which feature nylon threads wrapped in merino wool for the ultimate combination of next-to-skin softness and durability. The loose-fitting hood adds a dose of relaxed comfort, and the split side seam improves range of motion. They also added offset shoulder seams to eliminate chafing when you’re wearing a backpack. 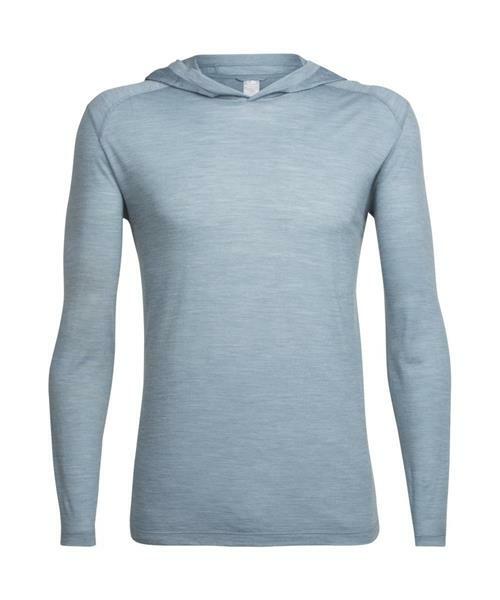 * Center back length: 76cm/30"
Sphere LS Hood - Mens is rated 4.9 out of 5 by 9. Rated 4 out of 5 by Theobviouschoice from Go 2 4 Sun Escape I now have 3 of these (different colours). Absolutely love this hoodie. As I'm older now and not a big fan of the sun exposure to area's on and around my head and neck. This clothing piece is absolutely awesome for those 10 minutes here, 10 minutes there when you don't want to wear sunscreen or a big hat. Great for summer camping to wear while sleeping. Just the right amount of weight to keep the cool night's air off your neck and head. As all icebreaker attire, if you own one, you know! There is no other alternative out there. If I could wish for one thing to be different about this piece is for it to be a little less loose around the torso, but I'm a skinny person. Some days it also feels nice to hid and this hoodie is good for that as well! Rated 5 out of 5 by Jonesy from The exact fit and comfort I hoped for I tend to bounce between medium and large size, and I chose to order this shirt in medium. It fit perfectly without feeling too snug, and the comfy fabric is something that needs to be felt to be believe. Rated 5 out of 5 by pbeats from Perfect for Cool Summer Evenings Great versatile shirt for a variety of weather. Fits a little small for my shoulders but I have a bigger build than most. Highly recommend! Rated 5 out of 5 by Skihikekayakfarmer from Super comfy My son loves these hoodies. They fit true, look nice and are super versatile. Rated 5 out of 5 by rcrusk from Looks gangster even in baby blue Perfect for that one layer in the heat or for the under layer in the cold. Rated 5 out of 5 by BikeHikeSki from Super Comfortable Great fit and amazing comfort from this hoodie. Definitely a favourite.